For a few years now, I’ve wanted to visit Montreal and Quebec City. Talk of visiting started with a buddy of mine who is into automotive racing. He has a modified corvette that he’s raced at various international racetracks around the country, and a few years back, he mentioned going to Montreal to catch a Formula 1 Race. Some of my favorite movie documentaries, like Senna, are directly connected to auto racing, but in general, I’m not super high on the sport. Watching it can be problematic, as the courses are huge and viewing isn’t easy. Often you’ll only see a small portion of the track and for the price (which are expensive for F1 races), it’s not worth it in my opinion. With that said, my motivation to visit Montreal for a race wasn’t huge, but the thought of visiting the city lingered in the back of my mind. After looking at my PTO/time off work days left at the end of 2018 and noticing I had a few remaining, I looked at taking a short-ish trip somewhere. I started browsing flights to a few destinations from my home city and found a cheap fare to Montreal. Normal flights from Minneapolis to Montreal are usually in the $650 range. This flight was just $342 paid in Flexperks at 1.5 cpp. For most domestic and cheaper international paid flights, I generally use bank points to pay for the flight. My bank points of choice are Flexperks followed by Ultimate Rewards. I’ve applied for too many cards to get any Capital One rewards cards, and Barclays shut down all of my accounts, so that wasn’t an option either. I can redeem for travel with Flexperks at 1.5 cents per point (cpp) and Chase Ultimate Rewards at 1.25 cpp. To redeem flights (or other travel) with Chase at 1.5 cpp you’d need the Sapphire Reserve credit card ($450 annual fee), which I don’t have anymore. I do have the Ink Business Plus card though, and that gives me a 1.25 cpp option. That rate isn’t amazing, but it’s a decent backup to have if Flexperks don’t work for a booking. I also have the ability to book flights at 1.5 cpp via the Amex Membership Rewards portal, but often don’t see all of the flights that other portals have, so it’s been a bit of a disappointment in that regard. I’ve had the U.S. Bank FlexPerks Travel Rewards Visa Signature Card ($49 annual fee) for roughly 20 years. It was actually my first credit card, and not long after getting into travel hacking, realized that I could downgrade, or product change (PC), into a similar card (U.S. Bank FlexPerks Select+ American Express Card) with no annual fee and keep the benefits that were most important to me. 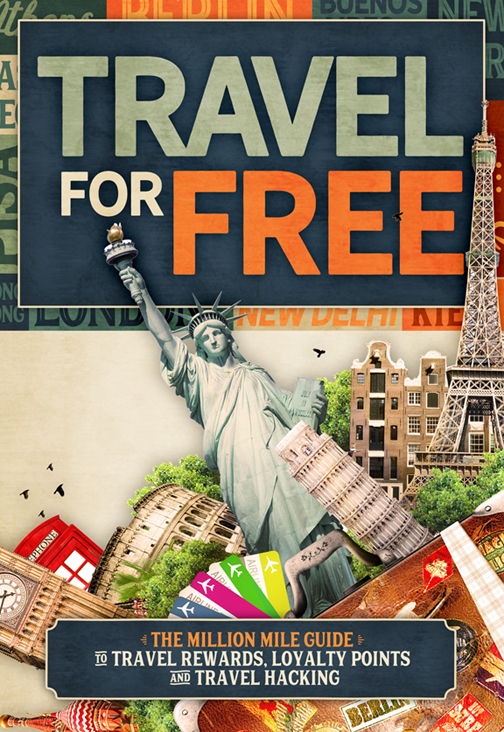 ALL of the Flexperks cards allow travel redemptions/bookings at 1.5 cpp, not just the annual fee cards. Flexperks is not an extremely popular travel rewards program, and I’d confess, not a top tier program either. However there are a few aspects of the program that I like. 1. Compared to other major points currencies like Amex Membership Rewards, Chase Ultimate Rewards, and Citibank Thank You points, you don’t have to carry and use an annual fee credit card to book travel and get 1.5 cpp. 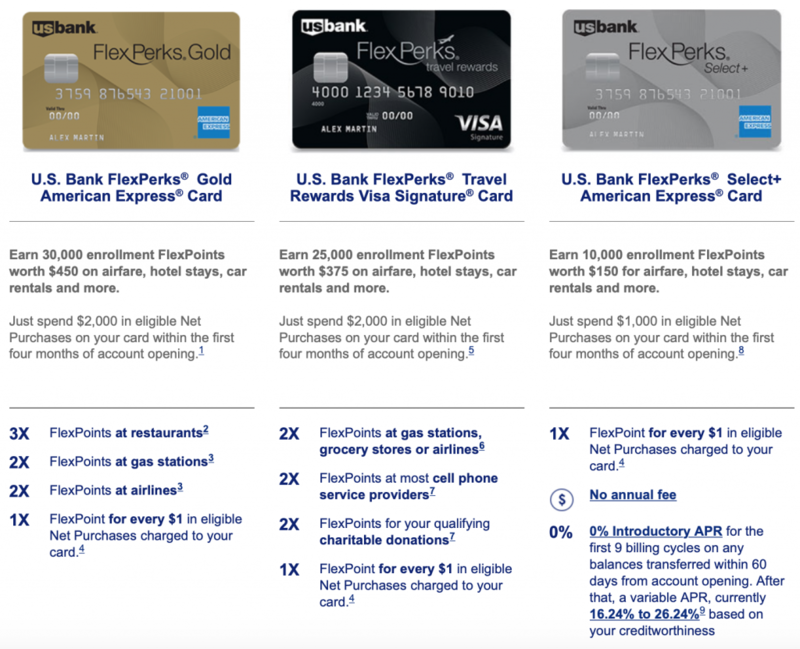 U.S. Bank lets you achieve 1.5 cpp with any of its Flexperks branded cards. That’s the good news. The bad news is that some of the points earning rates and category bonuses are not very competitive anymore compared to new products from competitors like the American Express Gold Card that earns 4x at supermarkets and restaurants, 3x with airlines (booked directly with airlines or on amextravel.com), and $100 annual airline fee credit. Fortunately, I had a nice chunk to work if a good flight deal surfaced. 2. Booking through the U.S. Bank Travel Portal is simple and efficient. I can find as many, if not more flights on there than with other major bank travel portals, the prices are extremely competitive, and there’s also a decent selection of international flights. Hotels and rental cars are redemption options too, but it’s important to compare prices with other sites before booking, as prices can vary widely (especially with rental cars). I’ve seen some very compelling hotel sales through Flexperks, but haven’t actually booked any using points yet. 3. Any spend directed at a Flexperks to earn rewards card has become an afterthought for me. In terms of manufactured spend (MS) linked with these rewards, I do MS to earn Flexperks, but that spend is basically “left over” or “junk” spend. It’s spend in smaller amounts that I casually put on cards when I don’t have other earning priorities. Now spending to earn Flexperks is kind of a luxury or splurge, as other programs offer much better return. The only thing drawing me to Flexperks is the opportunity to use points to directly pay for a flight or travel redemption (and earn frequent flyer miles or hotel points from a paid flight/stay). That aspect doesn’t factor into the typical return on investment calculations for Flexperks, but it still has value to me. Once I landed in Montreal, I was able to connect to the airport Wi-Fi and there were a few options to reach downtown. I chose the bus, as it was the cheapest (by far) and probably the most efficient too. From the airport, bus 747 brings riders to the central downtown bus station (or any normal stop along the way) and costs just $10 CAD for the trip in (one way). The great thing about that ticket is that it also allows access to the city’s metro and public transportation for a full 24 hours. Driving into the city, I was really surprised at how much construction there was, and how many high rise buildings there were. For miles from the airport there was major construction on the interstate highways with near mountains of dirt, large dump trucks parked and unoccupied, and a myriad of building materials scattered about. In short, the freeway getting from the airport to downtown looks like a complete warzone. Montreal construction is apparently a running joke with locals, as completed construction projects seem to take forever. Once we reached the city, it was one skyscraper after another, and for stretches, reminded me a bit of big cities in the U.S. like Chicago or New York. Downtown Montreal is a pleasant mix of old and new. It has lots of of modern skyscrapers, old brick buildings, and European styled boutiques and shops that give it a very unique feel for a North American city. With the mix of architecture and high quality food options, it reminds me quite a bit of Melbourne, Australia. There was significant construction in and around the downtown area including Old Montreal. Some of the main streets in Old Montreal were completely torn up. In central Old Montreal, people often had to choose a sidewalk on either side of the street to walk on, as some roads were completely dug up and depressed by 15-20 feet. In some ways that mess was a good thing, as it allowed me to stop into stores I probably wouldn’t have noticed to ask for directions and see what was inside. However, all that construction did made finding speakeasy bars in Old Montreal quite challenging! Compared to the greater city area, Old Montreal is quite small, but also very quaint and nice. There’s a full on gay region in the downtown area called the Gay Village. It has rainbow painted sidewalks, the usual assortment of gay bars and nightclubs, and a much more gritty and almost underground vibe than the rest of the city. There are more drugs and homeless in this area, but I felt quite safe the entire time. Apart from taking in some wonderful food and a stroll down Rue Ste.-Catherine (the Main Street in downtown), there are 3 things that you need to see and do in Montreal. 1. 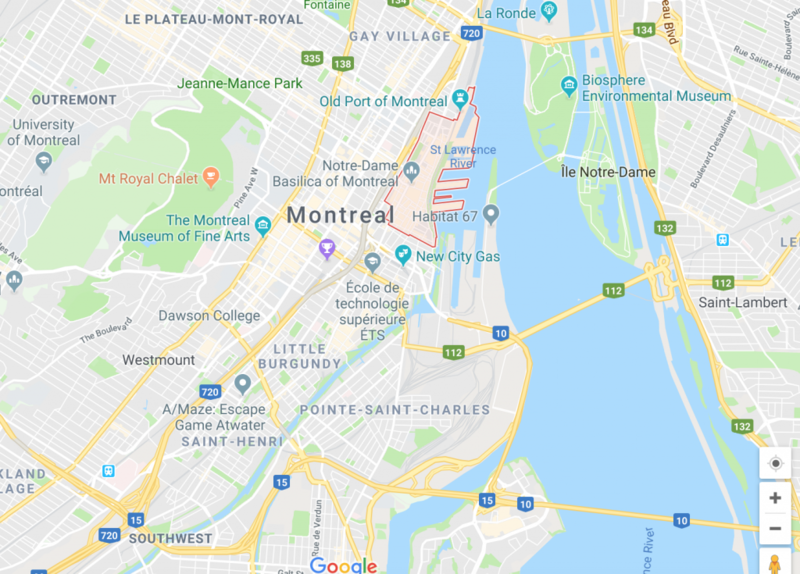 Visit/hike Mount Royal – although it sounds pretty massive, Mount Royal really just a large hill that stretches to about 750 feet above sea level. It’s surrounded large park area just a few blocks from downtown Montreal. In total Mount Royal and its park cover an area just shy of 500 acres. New York City’s Central Park which is 840 acres for reference. You can bus or drive up to the top or hike a number trails up too. There’s also a nice stairway complete with 400 wooden steps that takes around 30-45 minutes to get to the top. At the top there’s a wonderful concrete veranda that offers a very nice 180 degree view of the city. Note that if you go for sunset, on the way down there are many paths you can take and there’s almost no lights to guide your way. You could easily get lost, especially if your GPS isn’t working. Eventually you’ll get down, but getting lost might double or triple your time to get into downtown. 2. 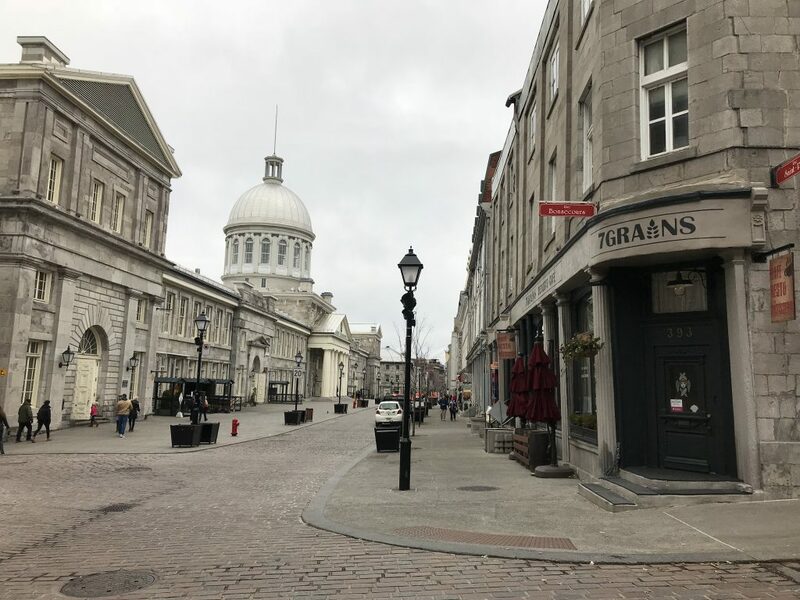 Walk around Old Montreal – set alongside the St. Lawrence River and dating back to the 17th century, this quaint little area of the city is a must see. It feels very European with buildings that are a bit more modern. Smaller stores, cobble stoned walkways, and wonderful restaurants and shopping make this a really cool place to be day or night. It’s a pretty romantic and unique place that makes Montreal stand out compared to other cities in North America. 3. 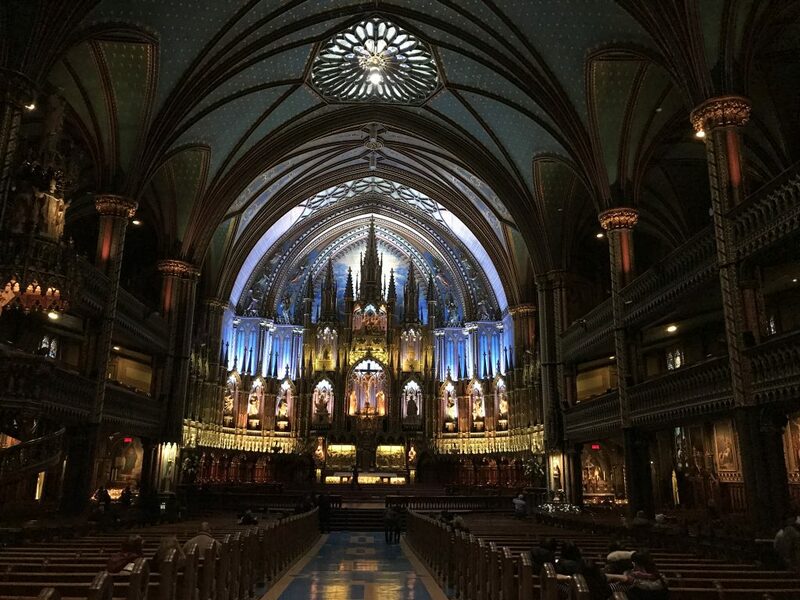 Visit the Notre-Dame Basilica – in the hundreds of churches and cathedrals that I’ve seen around the world, this is one of the best. The scale of it isn’t as big as many, but the colors, elaborate interior furnished with tons of natural wood are wonderful. Even for those without religious ties, you have to appreciate beauty like this. Montreal has some of the best food and restaurants for any city in the world that I’ve visited. The quality of the food, in stores, restaurants, and supermarkets was fantastic. I would guess that in the suburbs there are larger supermarkets that have lower quality and cheaper food, but every place that I went into in the city had high quality food. Even retail stores I visited sometime service food like sandwiches, tea, coffee, popcorn and more. Even with all of the great food, somehow the people here remain thin, fit and attractive. 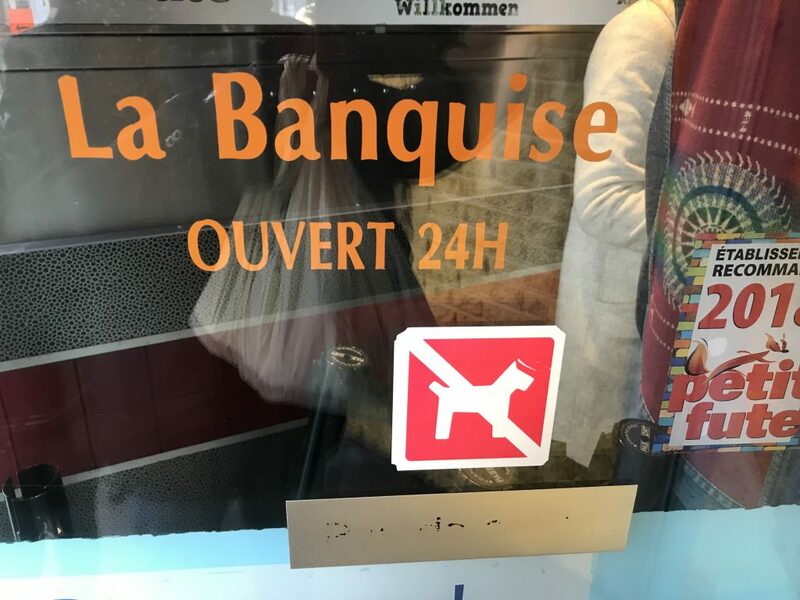 Extremely popular and open 24 hours, probably the most well known poutine restaurant in Montreal: La Banquise. 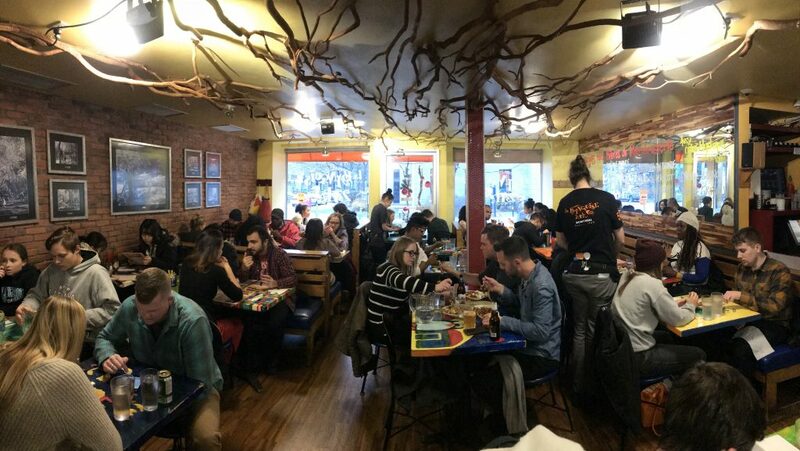 Tons of other great poutine places in Montreal, so don’t limit yourself to just a single locale. Great good and simple dining experience. If you can handle some waiting, La Banquise specializes in poutine and won’t disappoint. Simple facade for arguably the most popular dining experience in Montreal. 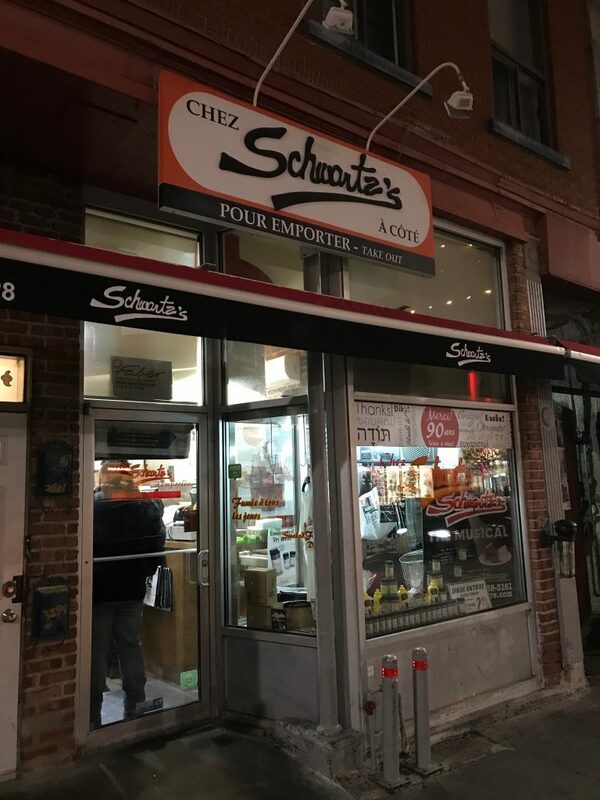 If you like smoked meat, Schwartz’s deli in Montreal is right up your alley. Again, it’s extremely popular and not just with tourists. 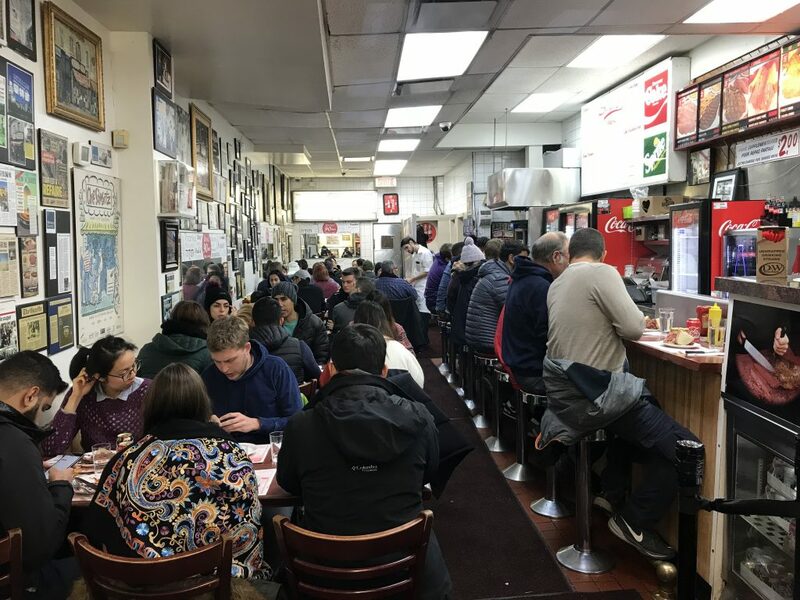 Like a small town cafe, Schwartz’s deli is a cool spot. Your clothes might smell like smoked meats for a few days though!! I browsed AwardMapper after booking my trip to check out the hotel options in Montreal. Award mapper is probably the smoothest running tool for viewing major hotel brands on a map. Montreal consists of many islands and a reasonably large land mass. It wasn’t entirely clear where the city started and stopped, or where the best areas to stay were. Lots of options to use travel rewards to stay though! The best value hotel redemptions IMO for Montreal were Choice, Wyndham, Hyatt, and Intercontinental. A few Hilton properties could possibly be lumped into the value category too, with Marriott/SPG offering poor value and higher award night prices. I was shocked to find out that there were no Radisson hotel properties in Montreal. 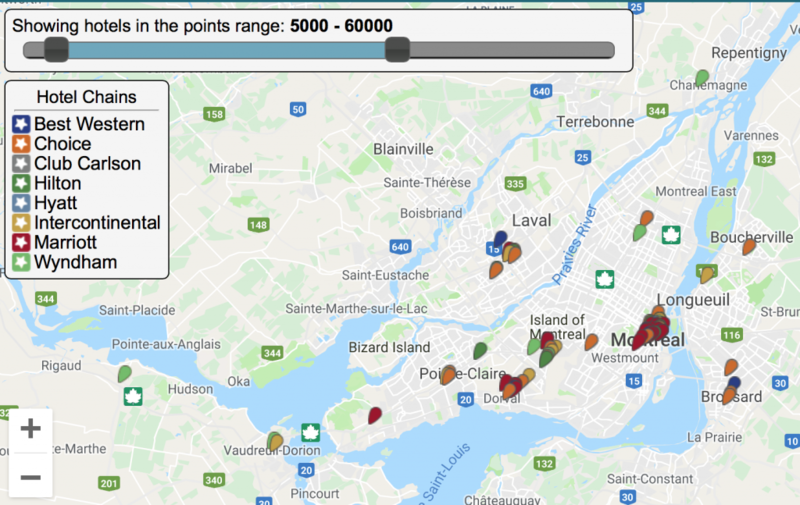 Marriott/SPG have by far the most hotel properties in Old Montreal (and in the downtown area) but the prices (starting at 35,000 points/night) seemed kind of ridiculous. I like to think of 35k a night as $17,500 of general spend on an SPG or Marriott rewards card. After seeing the math for a 4 nights stay @ 35k per night or 140,000 points total minimum, it seemed like a waste of hard earned points. Airbnb had plenty of options in Montreal but I didn’t know much at all about where to stay in the city and with all of the options, I ended up passing to save time. In the end I stayed at the M Montreal: Apartment, Hostel and Bar. It’s kind of funny that I have top level elite status with three major hotel companies, and I chose to stay at a hostel! Hostels aren’t for everyone, but many newer /modern ones could fit just about anyone. They range from dorm style rooms and bed setups to single apartment rooms. Shared bathrooms is often a feature, but private rooms often have those en suite. 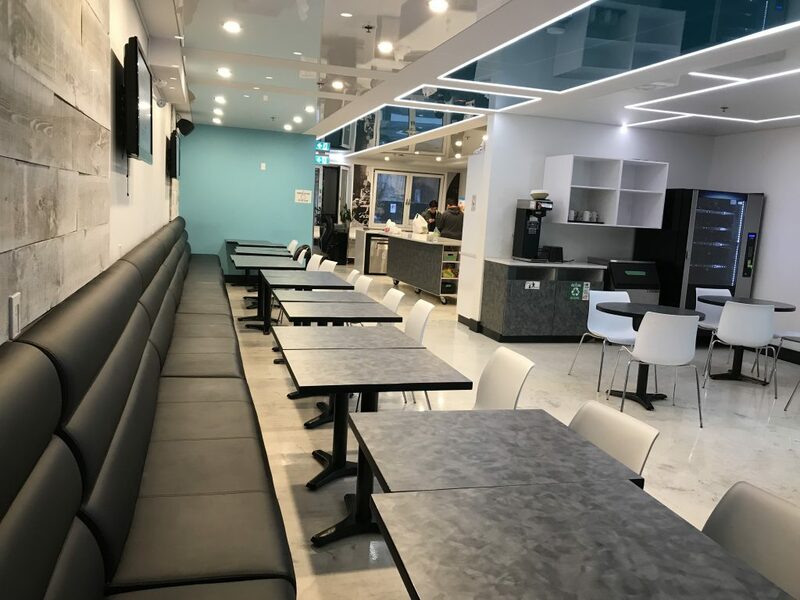 I stayed in a 4 person dorm room at the M Montreal, and the price for 4 nights at the hostel was around $112 USD. Huge kitchen area with 4 ovens for baking, TVs, several stoves, microwaves, and anything you’d need to make a meal yourself or with others. One of the best hostel bars that I’ve seen. It was also under the ground floor and did have an ‘underground’ feeling. Exposed brick walls, game areas, full bar, dance floor, and lots of room to socialize and be merry. Multi-level wood decks with bar and lounge area, views of the city and a couple of rooftop jacuzzis? The M Montreal is not your normal setup for a hostel that’s for sure. Montreal is extremely safe. Not once walking around at different hours of the day and night did I ever encounter any feeling of uneasiness about safety. Construction is everywhere in Montreal. Some of it adds time to transportation and disrupts trips mildly, but even with the large scale construction, it’s minor travel issue. The food was less expensive than my city (Minneapolis) but better quality (in general). Loved the food there. Poutine was good, but wouldn’t have it everyday. Mount Royal is great – nice views, walking paths, and close to the city center. The women are beautiful in Montreal. Some of the prettiest women in any part of the world that I’ve seen actually. Most had longer hair, were thin and feminine. Gorgeous. Montreal is much colder than I though it would be for mid-November. The wind whips around in the downtown area too, so it feels much colder than the thermometer says it is. It’s a romantic city. Couples would love it there, especially in the warmer months and in the fall. I can’t imagine the crowds there in mid summer, but they won’t be as big as major European cities. I wouldn’t hesitate to visit again, although I don’t want any part of being there in the late fall or winter. It’s too cold.